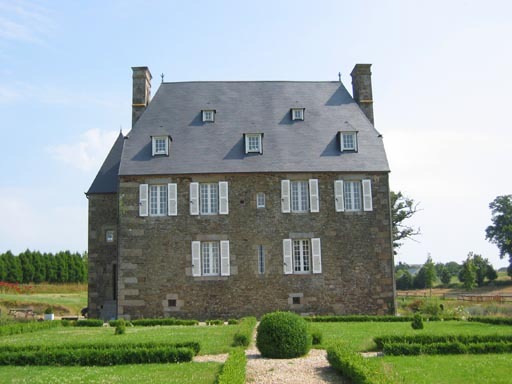 Built in 1590 under Henri IV, this mansion is the oldest building of the township. Perched in a small valley and visible from far away, it looks like the solid manors and castles of the region. Built in schist and granite, it used to have, before the changes made under the Empire by Colonel Jean-François of Buat, which in 1815 bought the Sémondière, a defensive aspect reinforced by thick walls (between 1m20 and 1m60). This is still visible with the presence of an arrow slit located at the base of the west gable and by the existence of an opening used as an observation post on the first floor of the back of the house. Yet, the two small watchtowers located on each side of the door on the north side have disappeared. Originally they used to be accessed through a horse ramp composed of large slabs of granite alternating red and blue tones, surrounded by a Louis XIII style ramp made of forged iron. This was described with great accuracy by historians at the beginning of last century. The current steps to access the ground floor, which is located 1m80 above the ground, come the edge of granite of this ancient pathway, which explains its rounded edges. The watchtowers were replaced by two windows breakthroughs under the Empire, to give greater clarity in the rooms.